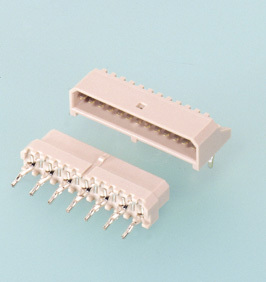 The JE connector is a compact, high density, board-to-board connector only 6.8mm (.268") high and 3.6mm (.142") wide. Its mating part has a 1.25mm (.049") pitch, single row construction. High contact pressure dual beam fork contacts are combined with a housing lock mechanism to ensure a reliable connection. The mating part has a 1.25mm (.049") pitch, single row construction. 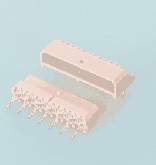 To meet the needs for high-density design, this compact, low-profile connector is only 6.8mm (.268") high and 3.6mm (.142") wide when mounted on the printed circuit board- roughly 40 percent smaller than our second smallest 2.0mm (.079") pitch model. This connector features a high pressure, dual beam, fork contact. The secure housing lock ensure a highly reliable connection even under the severest environmental conditions. 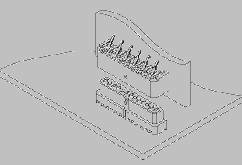 Box-shaped housing prevents misinsertion. The plug fits securely into the mating receptacle for greater resistance to vibration. The contact solder tails can be easily clinched. This allows efficient, secure mounting onto printed circuit boards. The bottom of the connector housing is designed to prevent flux from adhering.